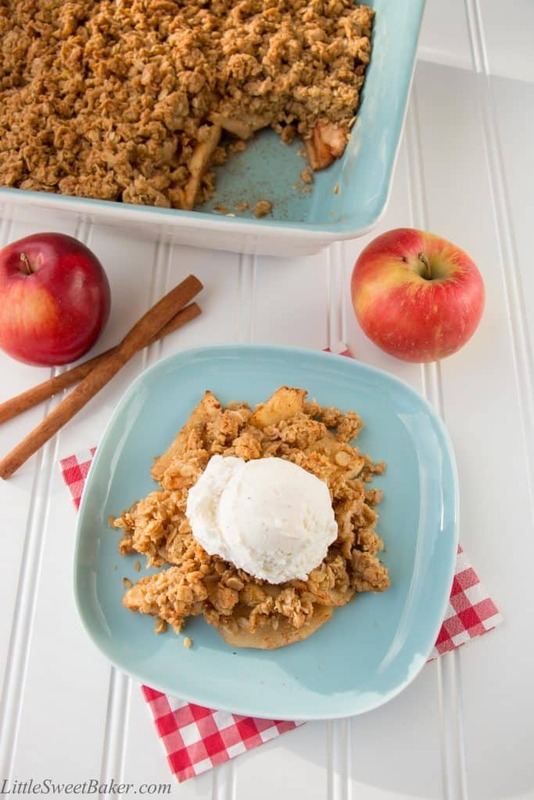 This dessert consists of warm, and tender apple slices, topped with a crunchy, buttery, brown sugar streusel. 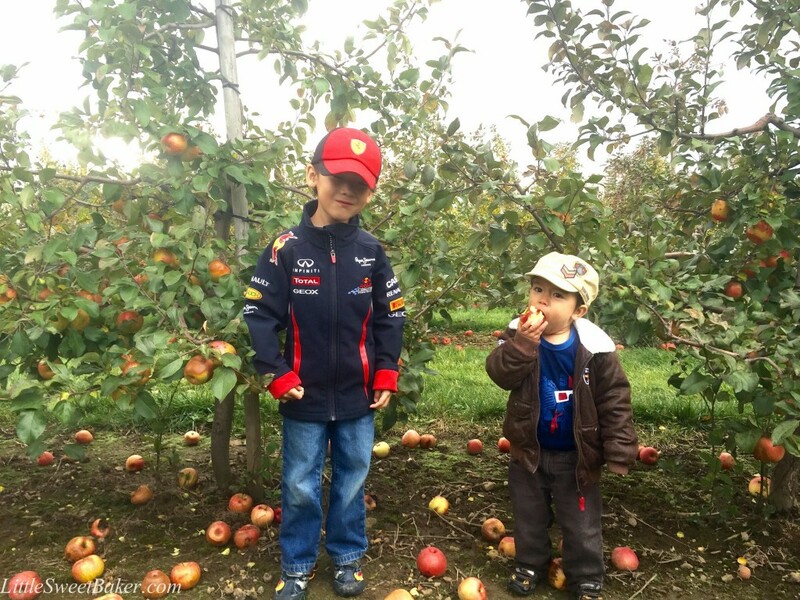 My boys had a blast, but they always love being outside and having lots of space to run around, so an apple orchard is like an amusement park to them. 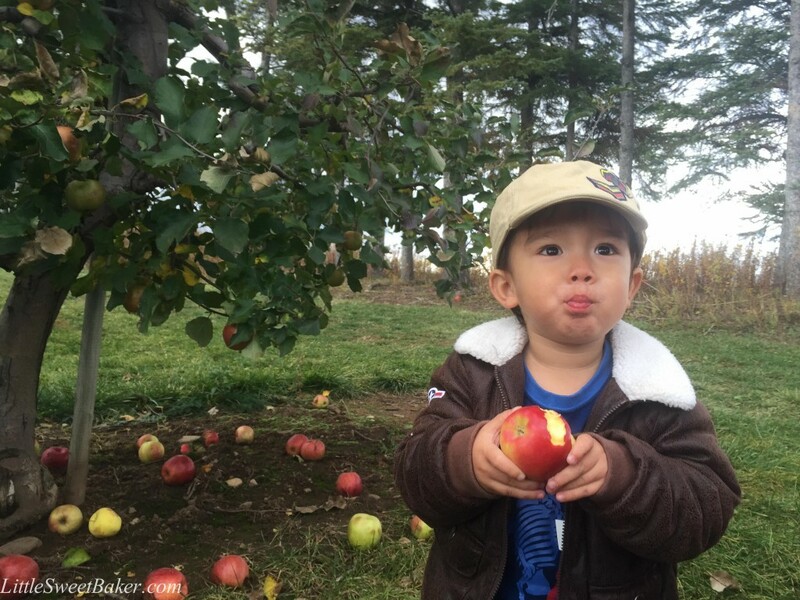 Much like what happened with our strawberry picking experience, Ethan was very helpful with picking the fruits while Charlie was only interested in eating them. For a little guy, he is quite the eating machine. (be warned, mommy moment) Here’s another photo of my baby. He is 2 years old, so technically a toddler, but he’ll always be my baby. Lately, every time I look at him, I just wish he would stay this small forever. Okay, enough of the sappy mommy stuff, back to the apple crisp. I kept this recipe pretty simple. Since the apples I was using were already sweet, I just added some cinnamon and nutmeg to the filling for some spice and flavor. For the topping, I went with a higher rolled oats to flour ratio for an ultimate crunchy texture. I used brown sugar for a toasty caramel taste and butter for the richness and to tie everything together. 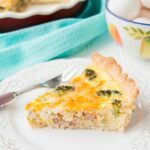 You can easily cut this recipe in half and bake it in an 8×8″ pan for smaller portions. You can also replace the all-purpose flour with any type of gluten-free flour. I find oat flour, almond flour or coconut flour to be the best substitutes if you want to make this into a gluten-free dessert. 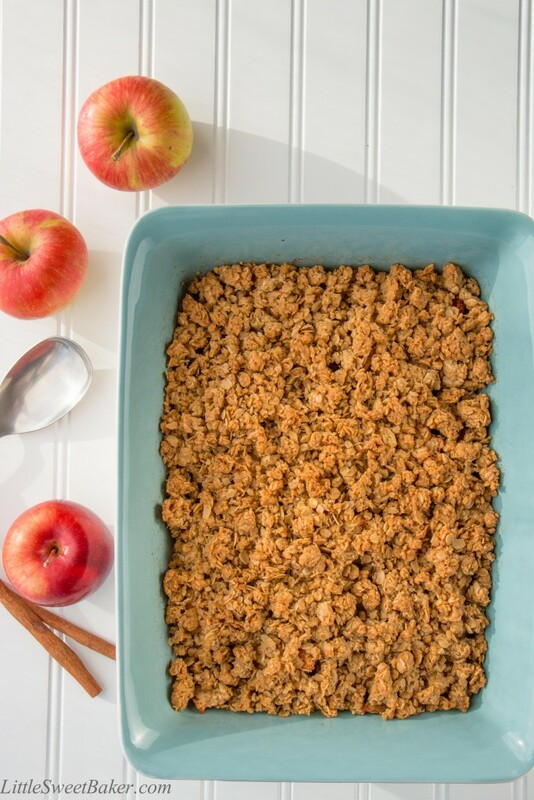 There is enough streusel in this recipe to nicely blanket the spiced apples and there is a perfect amount of crispy crunch to every bite of warm baked apple slices. 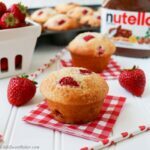 It’s not too sweet, so it works well for brunch or even breakfast with your morning coffee. 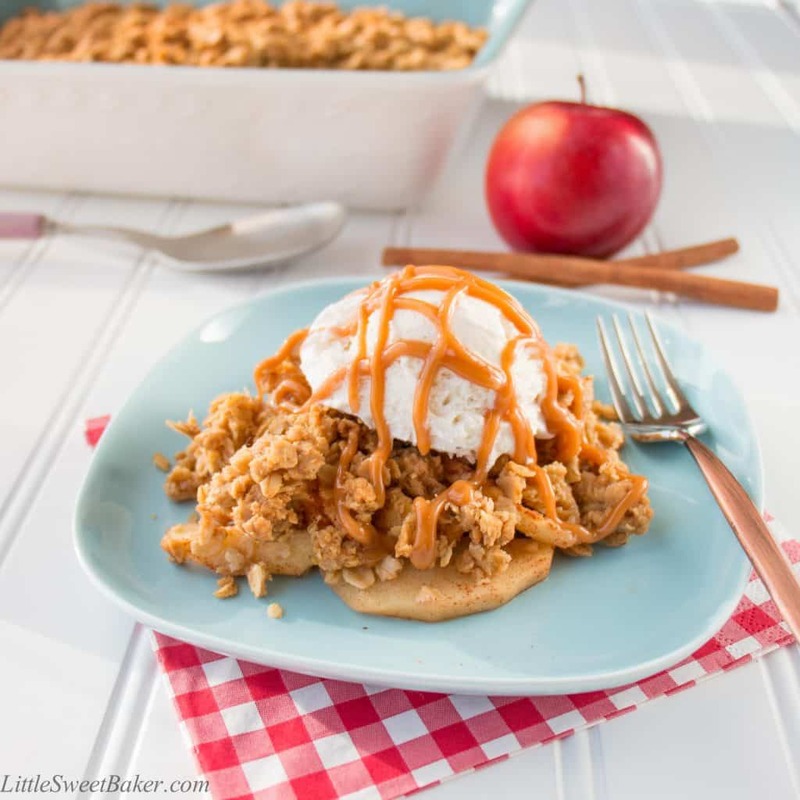 This apple crisp is delicious on its own, but even better with some vanilla ice cream. Now, drizzle a little caramel sauce over that and you will hear the angels sing “hallelujah”. This is also a perfect dessert for the holidays. You can prepare it ahead of time, then bake it while everyone is enjoying dinner. 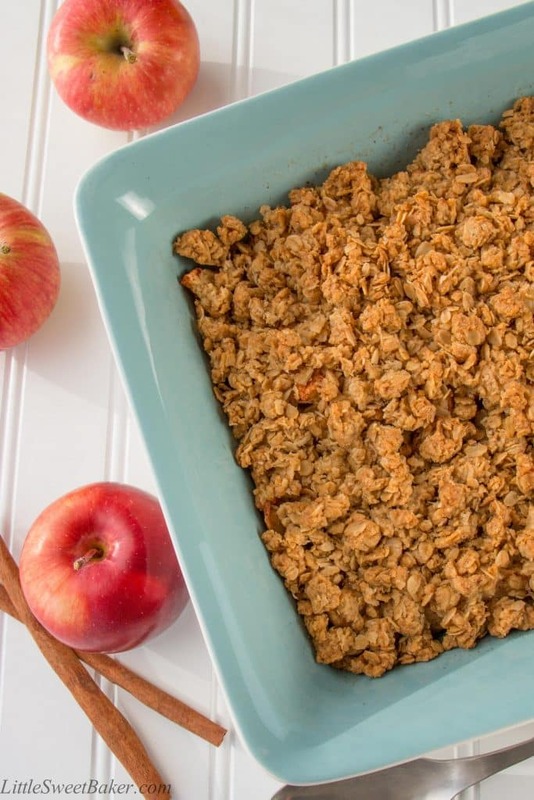 Once everyone is ready for dessert, you’ve got a freshly baked bubbling apple crisp to serve. 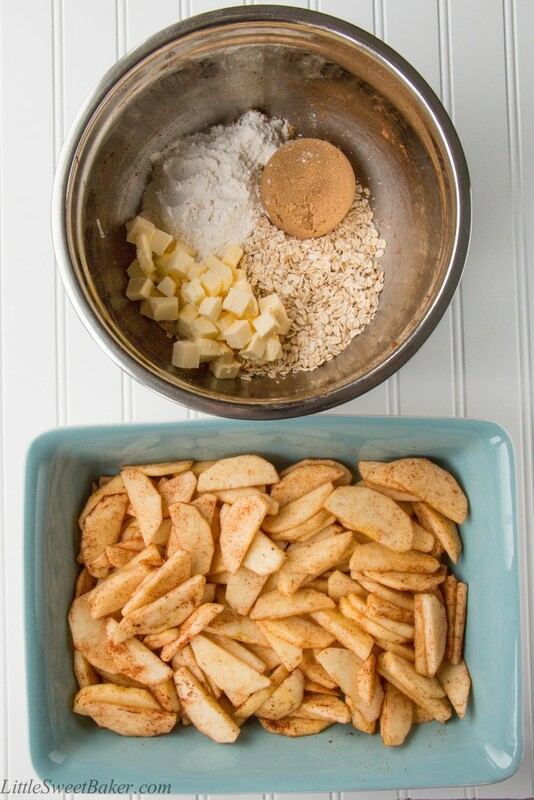 In a large bowl, sprinkle the cinnamon, nutmeg and sugar over the apples. Gently toss to coat. Evenly spread onto baking pan. Using the same bowl, mix the rest of the ingredients with your hand. Work it until all the butter is mixed in. Break up the streusel into small pieces to cover the apples. Bake for 55-65 minutes until apples are tender. Best served warm with some sweetened whipped cream or vanilla ice cream and a little caramel sauce. For smaller portions, simply cut the recipe in half and bake in a 8×8″ pan for 30-35 minutes. This would serve about 4-6. Gluten-free option: substitute the all-purpose flour with any gluten-free flour. Oat flour, almond flour or coconut flour is best. 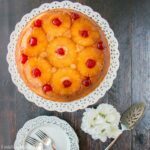 I will also be sharing this recipe at Fiesta Friday #93 hosted by Angie@TheNoviceGardener. 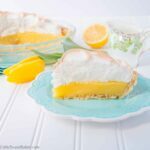 Come check it out for many other great recipes! I baked this the other day and I love the warm inside after letting it cool down for a bit. My family gives your recipe 5 stars! Lily, thank you so much for bringing this apple crisp to the fiesta this week. I love the presentation, and it makes for the perfect comfort food this fall. Your boys are also too adorable. Love all the pictures. Happy FF, and have a wonderful weekend! 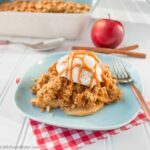 I think apple crisp is one of my very favorite recipes! When I was in school, they always served it with chili, and it was my very favorite meals. 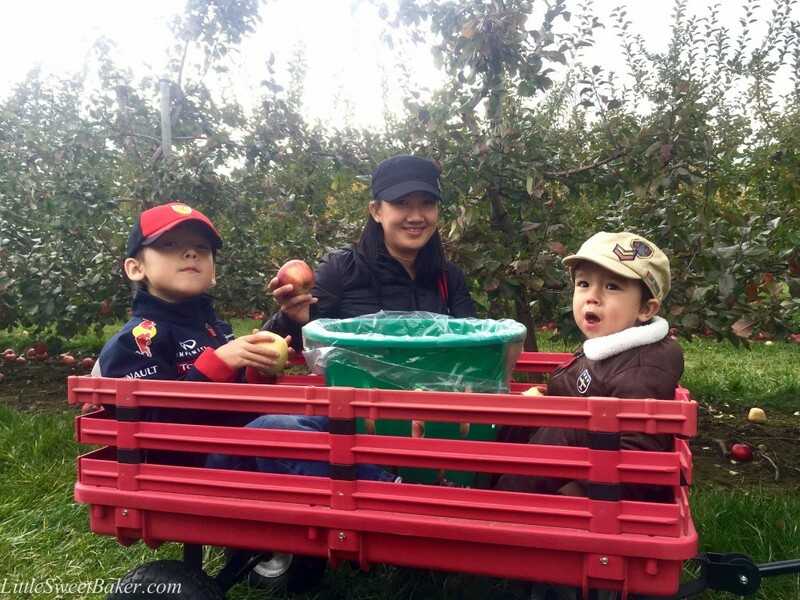 Your little kiddos are so adorable!